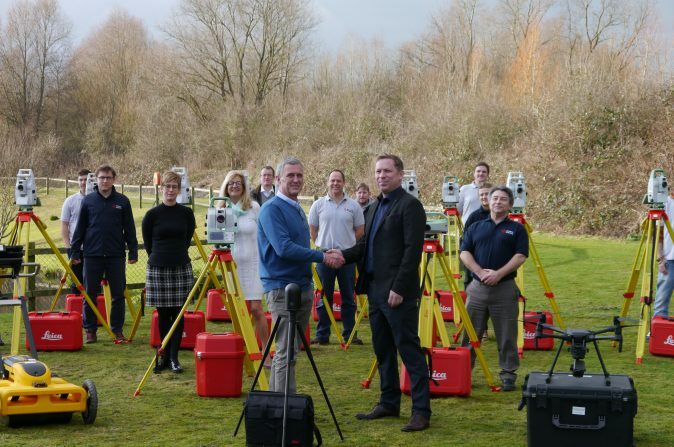 UK Land and Engineering Survey company, Warner Surveys, has received delivery of a huge stock of brand new equipment worth more than £500,000. The purchase, facilitated through a finance deal with Opti-cal Survey Equipment and Ignition Asset Finance, marks one of the highest value single purchases in the UK Surveying industry. Warner Surveys, which has offices in Reading, London, and Bristol, has been established for almost 40 years and now has some 80 staff globally. With recent advances in technology, the company felt it was time to upgrade the bulk of its equipment to benefit from new cutting-edge devices available on the market. The company worked closely with Opti-cal and Ignition to arrange a competitive finance package for more than 30 pieces of high-tech equipment including Leica Viva TS16 and Nova TS60 Total Stations and Leica LS15 Digital Levels, as well as a Leica BLK360 3D Laser Scanner. This highly sought-after piece of kit is the world’s smallest imaging laser scanner, simplifying the collection of accurate 3D imagery and measurements. “The importance of being at the forefront of new technology cannot be understated within the Surveying profession. This latest investment enables Warner Surveys staff to operate at peak productivity whilst maintaining the highest standards of auditable accuracy. “With multiple survey teams operating across the UK as well as Europe, the Middle East, South Korea and Kazakhstan, the performance and reliability of survey equipment must now be beyond question. “Opti-cal have been working with Warner Surveys for 15 years supplying a range of high-end survey equipment for an array of projects throughout this time. Paul Caunter, Director at Ignition comments:“When looking to upgrade several business assets, it makes good financial sense to make a single large purchase, just as Warner Surveys has done. Although this can seem daunting to business owners, it often means a more competitive deal can be reached, and by spreading the costs over an agreed period of time, financial forecasting becomes more manageable and predictable.